It is in the nature of a torsion engine that its best shooting qualities are arrived at by progressively perfecting the balance between the two spring bundles that comprise its power plant. 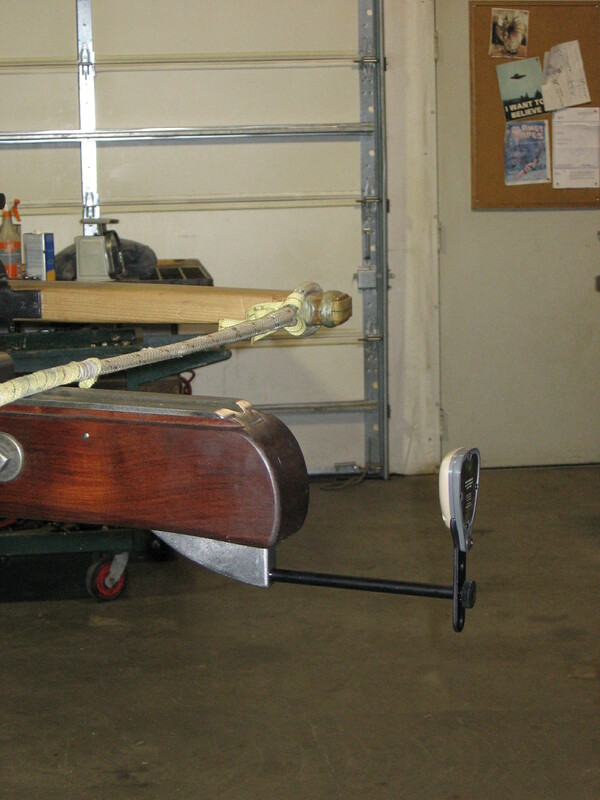 The start of this torsional balancing act is often accompanied by some pretty wild shooting. At this stage, power levels are low and I only have a vague idea of where she is going to hit. For example, I didn’t really want to sink a bolt into this stump of wormy old pine. Things won’t get any better until the bundles are properly tuned. In the mean time I seem destined to skewer a bunch of logs and stumps. I suppose I am going to have to get all athletic now to dig this thing out. Honestly! Two little lumps of pine in my big sand pit range, and my two shots have to strike them both. I fear the Catapult Gods are toying with me again. I guess I’d better buckle down and make some more bolts. 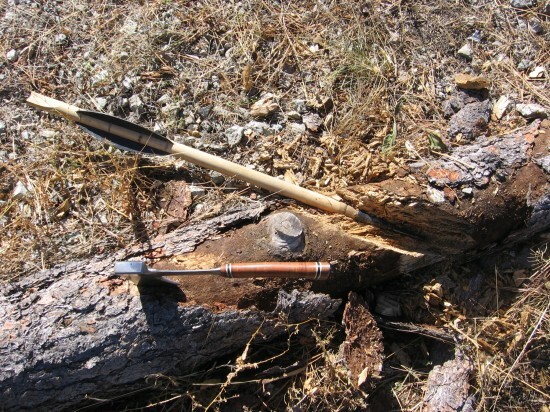 Our sole remaining ballista bolt found safe lodgings in that pine log from yesterday. 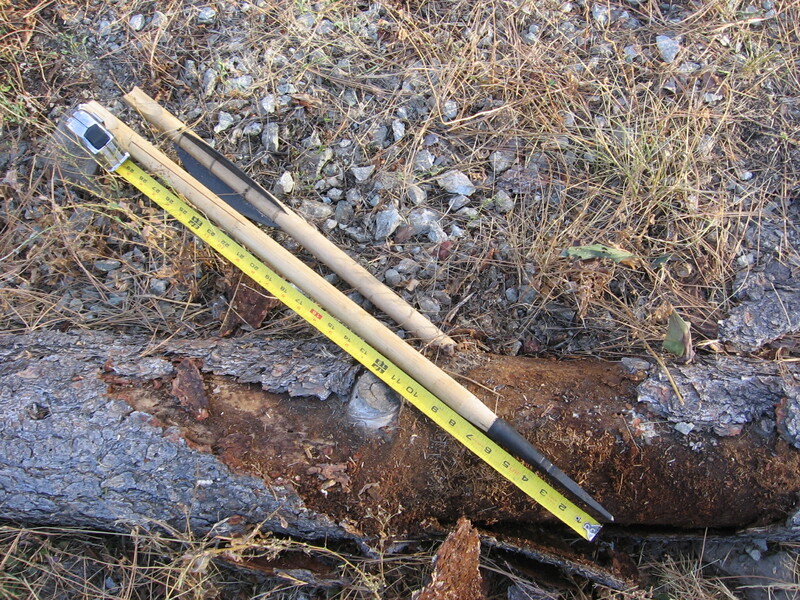 While not exactly rotten through, decomposition had reduced the density of the pine to maybe that of Bass wood. Soft but not gone, as it were. Actual depth of penetration was 10″, not the 12″ as surmised yesterday. At least we have a viable projectile with which to try another shot. We will see what an another 7 1/2 degrees of rotation does for its zippiness. This first shot with our new Mk. VIII limbs struck a tad low and scuffed a two foot furrow in the dirt before burying itself twelve inches into the old pine log at the edge of our parking apron. 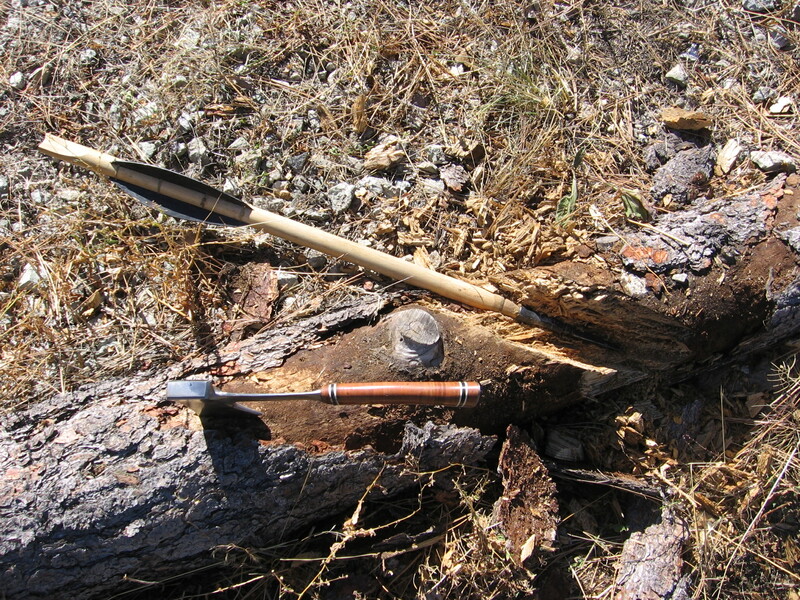 I have laid an identical bolt shaft and head on top of the log to indicate the depth of penetration. Of course this much of a puncture may say as much about the relative rottenness of our parking log as it does about Firefly’s actual performance. …..Although the shot looked quite fast for the measly 2500 lb draw weight that was used……. Still only a flashing error reading from the new chronograph. I may have to mount it separately on a tripod to avoid smothering the poor thing with too many vibrations. 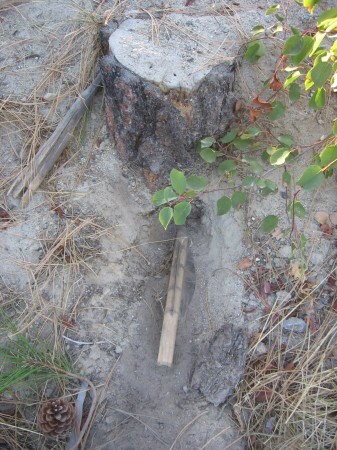 Tomorrow I will take a chisel to this log and we will see just what is what. Got to get that chronograph working. Here is the vid of this shot. Note the dismally slack bowstring. First shots in a tune-up sequence are always thus. P.S. Just got through playing this vid in slow motion. It looks like that sloppy string slaps itself all the way out over the chronograph. I’m hoping that’s the cause for the error reading. P.S. P.S. I remember what old Dale Sorrels used to say, “When in doubt, and only absolutely, positively when you’ve tried everything else, take a look at the instructions.” Oh yeah, that….. So anyway, I had assumed the flashing 2 and 04 that appeared on the chronograph were error readings. Not so it appears. This particular device calls out the velocity by code. It now appears that this first 7000 grain bolt launched with the VIII limbs was traveling at 204 feet per second. Not hopelessly bad given the relatively low level of torsion that has been induced into the bundles so far. Also that loose bowstring is a real velocity killer. I feel stupid for not reading those instructions more carefully Dale. Here’s a photo of that bracket and the new chronograph all installed and ready to go. Very nice, but that curvy block thing looks a little more fancy than a “bracket”. Who exactly are you trying to impress? I dunno. This whole thing is supposed to be an objet d’art you know. An objet d’………. Oh! never mind. Firefly has a new chronograph to record her vital stats. It is a Doppler based unit and needs to be hung from her snout with some kind of solid bracket arrangement. This should be completed by tomorrow. In the meantime, here’s a different angle on her. I still find myself wondering what the original Orsova ballista actually looked like. Endless conjecture is possible on that one. 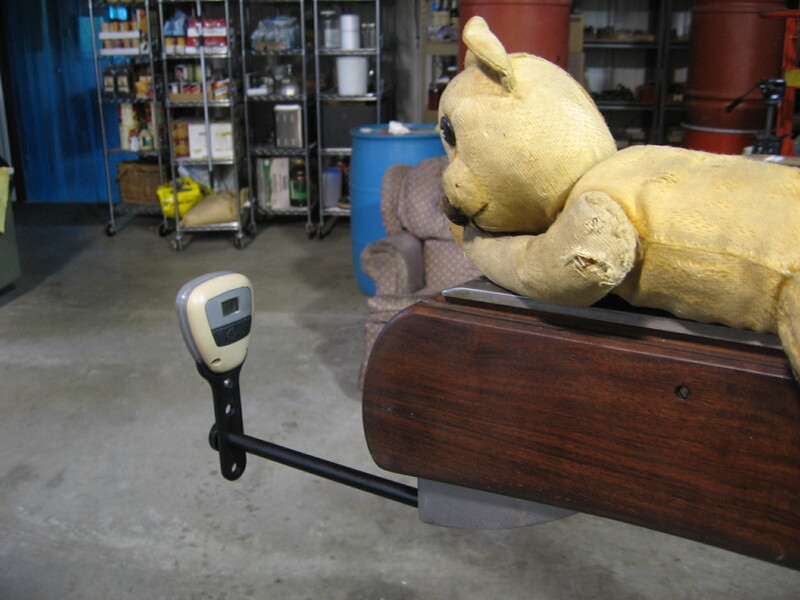 This is such a goofy, freakin’ project. These L shaped extensions have just been added t0 the winch pawls. It will make running out the winch rope much easier on the hand. Trying to depress the little nubbin I had there before was getting to be a pain. Literally. Completing this little detail signals the start of what I hope will be an extended phase of shooting. Eyes are dotted, crossing the T’s is well in hand. 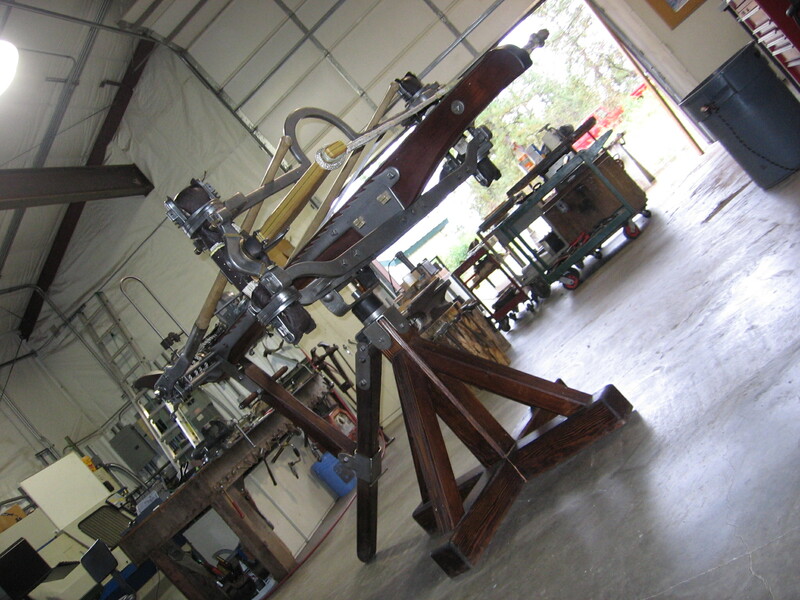 Torsional tightening sequence begins tomorrow. The nock for the bowstring is well served by this design. …… (Sorry). When there is minimal penalty, doing things in two’s is a valuable redundancy for the aspiring catapult maker. These twin whippings are both light and exceptionally strong. What’s not to like? The unused notch on the belly of the limb will be utilized to anchor another binding that will secure the dual retention straps that are wrapped through the bowstring loops. 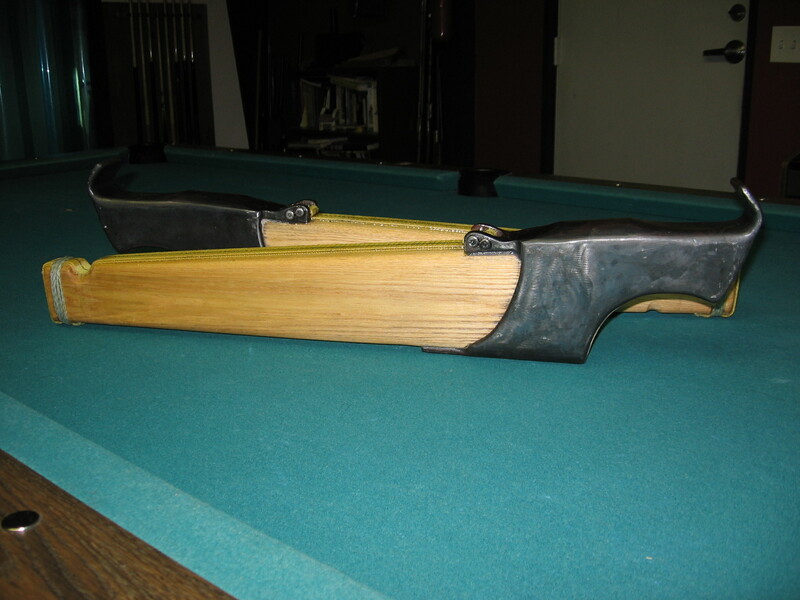 Joining the bowstring to the limb tip is a fundamental essential for all inswingers. Apart from the safety aspects (well demonstrated in the video of that limb break from a few weeks ago), it is important to prevent the bowstring from being expelled downrange. Just because this is a blog, and aspires to be no more than a detailed diary of our shenanigans here in the little catapult factory, I present the following photo in testament to today’s labors. Some epoxy soaked, finish whippings, made from that same Dacron thread I was contemplating the other day, are held taut by some genuine Okanogan rocks. ……. I know…… the thrills just never cease. 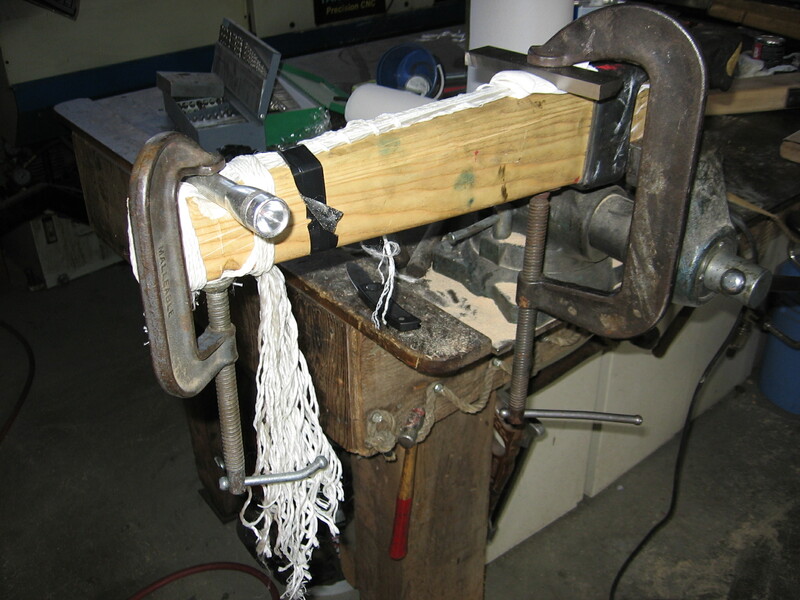 Yesterday’s plan to back the limbs with Dacron fiber went bust when I actually tried to implement it this afternoon. For better or worse, I used the Kevlar webbing instead and must admit, it did make a neat job of it. 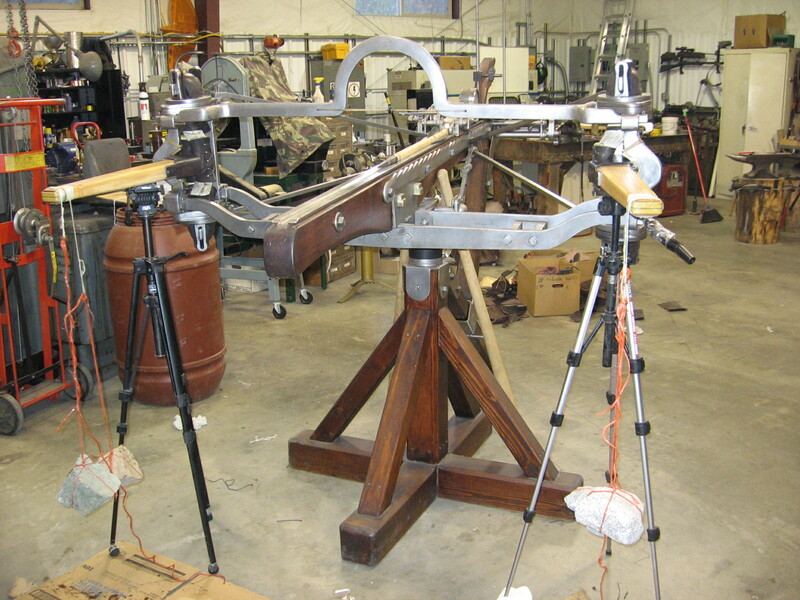 I will just have to assuage my ballista fashion sense with the clear knowledge that our mighty limbs now at least have a safety strap laminated onto them. I should be able to install these Mk VIII limbs tomorrow. Groovy. Also: Weight on these Mk VIII’s is an eye watering 10 1/4 lbs each. This is exactly 2 lbs. more than the previous set that failed. Almost all of this increase is situated close to the fulcrum. (In exact terms: the limbs are 28″ OAL and their CG is 5″ out from the theoretical fulcrum at the center of the spring bundle.) In a game of trade offs, this type of weight increase seems a reasonable price to pay for the new muscle it brings into play. This grubby looking mock up is just me fooling around with one of the old limbs and some Dacron line. I am trying to find a sensible way to deploy this material as a tension strap. I think I’ve found it. No hurry though. We’ll sleep on it and see if this all looks as brilliant tomorrow as it does now. 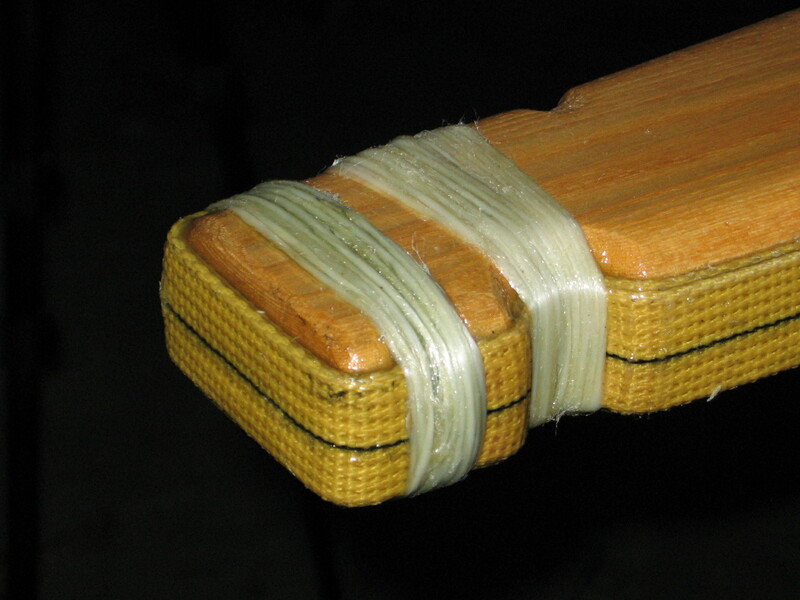 I had planned on using Kevlar webbing for a tension strap, but that plan has a couple of problems with it. 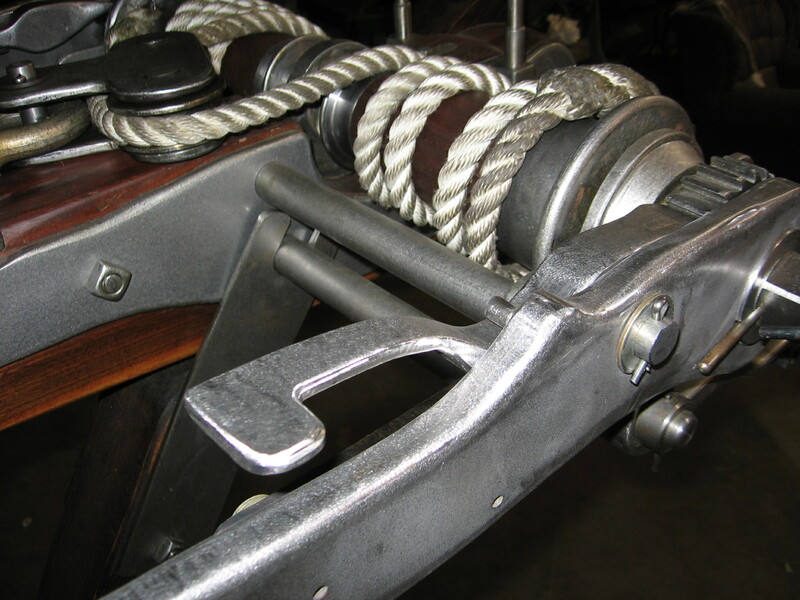 First, with any webbing material there are a large number of the strands that run perpendicular to the line of tension. In short they are not doing much, whereas with simple longitudinal fibers laid out as above, they all have some work to do. My second problem with webbing is that …. well… it looks like webbing. Yuk! If I do it right, these Dacron fibers won’t be such an infernal eyesore. They may even approximate the looks of bleached sinew. Yum.